Light: Being delighted with your own achievements. Recognizing your own talents and abilities. Reveling in the good things life has to offer. Indulging yourself. Relaxing and unwinding. Having everything you need in order to feel complete. Shadow: Being smug. Satisfying yourself at the expense of others. Being selfish. Over-indulging. Avoiding work that needs to be done. Claiming achievements or skills you do not possess. Never being satisfied, no matter how much you have. Story: The Main Character expresses supreme confidence. Alternatively, the Main Character completes a task, but is denied the promised payment. Relationships. Appreciate what you have. When things are good, it’s easy to take someone for granted. Today, emphasize the ways your friendships and relationships are working for you. What’s working? What’s comforting? What do you have to smile about? Work. Who should your work satisfy? What are the criteria used to evaluate your work’s completeness? Knowing the answer to these questions is the key to success. Resist the urge to revise and revise; know when to be happy with your best effort. Spirituality. Finding your center—a still point, a place of peace insulated from outer disturbances—will help you maintain an enlightened perspective. When pressured or rushed, remember to breathe. Pause, retreat, withdraw. Allow your spiritual discipline to yield practical results. Personal Growth. A life of constant luxury breeds dullness. Learn when to push back; you can be satisfied with less than you think. With a little restraint in place, you’ll be better equipped to enjoy real luxury when the time for indulgence comes. Fortune Telling. Whatever you want, you’ll get it. When? March 1st through 10th. The Happy Merchant. The RWS-inspired merchant sits in front of a raised and curtained platform, looking as happy as he can be. 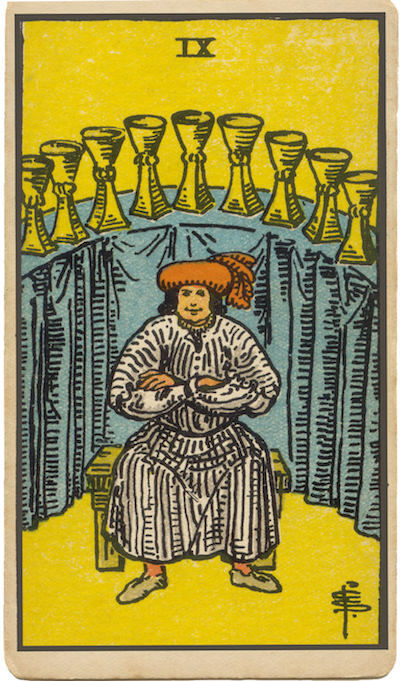 The Gilded Tarot’s wine maker is “in his cups,” merry as ever. What outcome would delight you? How can you make that outcome more likely? What’s behind the Curtain? The curtained shelf on RWS-inspired cards prompts much speculation. What’s the merchant hiding? And to what extent is that secret responsible for his apparent satisfaction? In your situation, what information is being hidden or repressed in order to maintain false happiness? The Life of Leisure. In the Blue 9, we see a picture of total relaxation: an escape from the worries and cares of the world. What steps would you have to take in order to experience this kind of peace? Do you know what it would take to satisfy you completely? The Marseilles Image. Strong emotions (represented by the nine Cups) have all but crowded out opportunities for growth and prosperity. To what extent do your emotional responses support your goals? How might they interfere with your achievement of satisfaction? If I could have anything, what would I have? What is my attitude toward luxury? Do I deserve it?